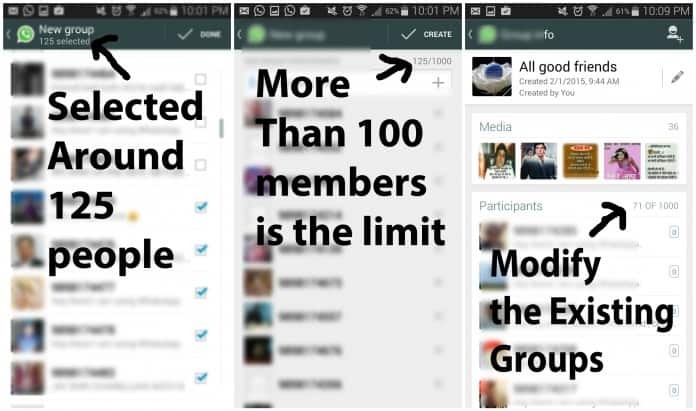 How to add more than 100 members in WhatsApp Group? As well all know that WhatsApp is coming with a Calling Feature soon, Yesterday in a post I explained you “How to enable WhatsApp Call Feature without getting an invite” and today WhatsApp has found a patch for that and that trick has stopped working. Today is something which is often required by many marketers/large group students or any other large online community. Since WhatsApp makes communication easy and faster most of the online communities are thinking to settle on WhatsApp but one limitation of not being able to add more than 100 members in groups stop them to connect on WhatsApp. Previously WhatsApp allowed only groups with 50 members, However the size was increased to 100 after the Facebook-WhatsApp acquisition. However, 100 is also a small number when it comes to large groups which has more than 500 members. So what can they do? They can obviously go with the various WhatsApp Mods available but then like WhatsApp banned the users for using WhatsApp Plus. The same might be the case. So while trying to enable the call feature yesterday I found a way to add more than 100 participants/members in a WhatsApp Group. Yes! More than 100! Are you shocked? Don’t be let’s begin with the steps to add more than 100 members in WhatsApp group so that you can widen your Groups in case you are having large number of people. If you are having all of these things ready with you then lets begin with the steps so that without wasting a minute you can widen your circles and can add more members to your existing circles to make them a part of the group. 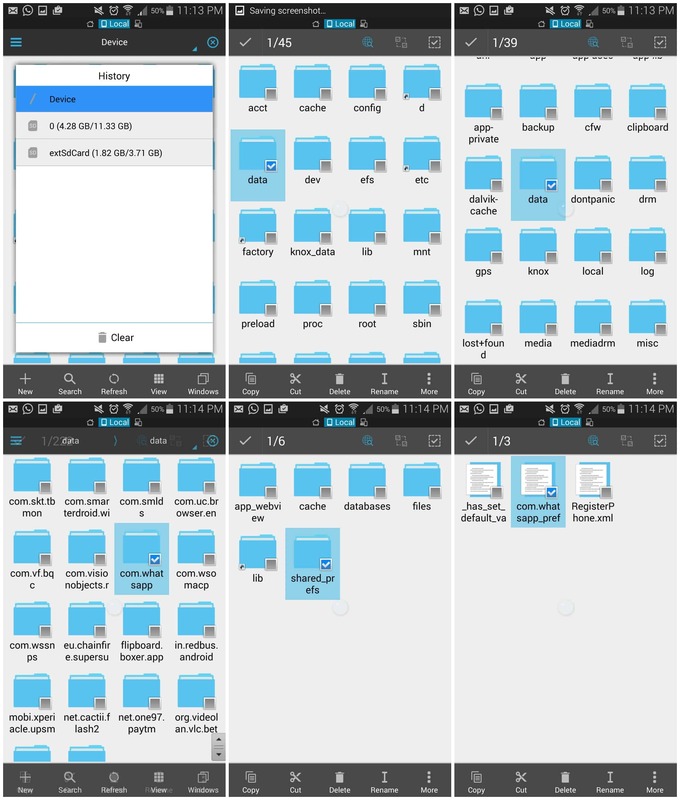 The first and the foremost thing you will need to do with the ES File Explorer is, you need to enable the “Root Explorer” Option in it, To enable the root explorer in ES File Explorer, Just Open it and swipe from left and enable the Root Explorer by giving access to the superuser. In case you are confused with enabling root explorer just follow the sequence shown in the Image below. Step 2 : Open the below shown Folder and Edit the WhatsApp_Preferences. So once you’ve given proper access to the Root Explorer and have enabled root explorer then lets begin with the Editing WhatsApp_Preferences File. So navigate to the following Directory : data/data/com.whatsapp/shared_prefs/com.whatsapp_preferences.xml and edit the com.whatsapp_preferences.xml file. Didn’t get the proper location? didn’t find the file? Follow the below image to reach the correct destination. 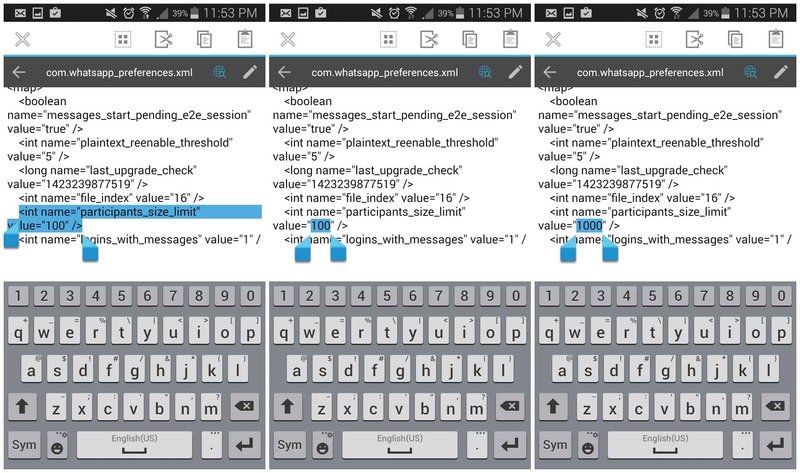 Step 3 : Edit the WhatsApp_Preferences.xml File using the Editor. 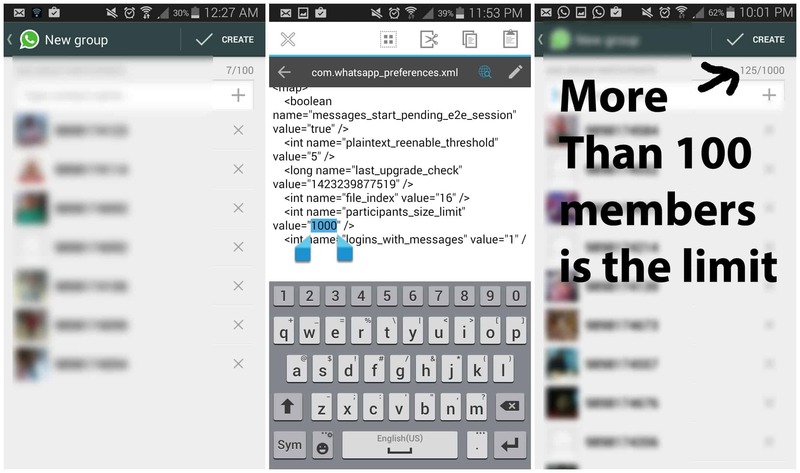 “int name=”participants_size_limit” value=”100″ and replace the 100 by the maximum number of members/participants you would like to have in your Group, Here I’ve replaced by 1000 because I want 1000 members in the WhatsApp Group, You can keep the number depending on your needs. After changing it, save the file and close it. Now go to the App Manager and Force Close WhatsApp. After force closing come back to WhatsApp and Turn it on and now create a group and add members, you will see that the member limit which was previously 100 has raised to the number you entered in the maximum participants in the code. That’s all folks, Now you can add as many people you want in your WhatsApp Group. At the end I would like to tell this is a trick which I came across while testing some stuff. This information is just for information purpose. Neither Droidmen nor the Author would be responsible for any problems if they take place. P.S : This trick no more works, WhatsApp has patched it. Previous articleHow to Enable WhatsApp Calling without Invite?